In her Philippine Star column “From A Distance” published last June 30, Carmen Pedrosa wrote that President Rodrigo Duterte’s June 22 blasphemy was not about God. In fact, the title of that issue’s column made her case very clear: “The issue is not God“. Ang guinauá niyá… quináin ni Eve. Tapos si Eve, guinising si Adam… —siguro catatapos lang— ‘cumáin ca rin.’ So quináin ni Adam. Then malice was born… WHO IS THIS STUPID GOD? Estúpido talagá itóng p***** i** cung ganán. You created some, something perfect, and then you think of an event that would tempt and destroy the quality of your work! We are aware that President Duterte has a love-hate relationship with the Catholic Church. For all intents and purposes, he may even had the Church in mind when he uttered this blasphemy. However, it is clear, crystal clear, that the President used the Genesis creation narrative —the very same story that other Christian denominations and even other religions share— as basis for his elementary understanding of God. How then could she say that this is not about God? We are aware that Pedrosa is a staunch, nay, blind apologist of the Duterte regime. As such, it is understandable that she will do whatever it takes to make the President spotless, even to the extent of pretending that the President did not commit blasphemy… not to mention pretending to be an expert in Filipino History. To defend the President from the Catholic Church, Pedrosa demeans the latter by using textbook Filipino History. She begins her cerebral column by saying that José Rizal and his family were victims of what her hateful imagination calls “friar power”, stating further that the Rizal family tried to defend the land that they had cultivated. But since she was using textbook knowledge on Filipino History, she failed to mention that it wasn’t their land in the first place. To make a long story short, that land in question was merely leased to them by the Dominicans, and that the Rizal family lost in a litigation against the said friar order after a protracted land dispute. I would have also loved telling Pedrosa that Rizal’s mother was made to walk from Calamba to Santa Cruz, La Laguna not as punishment for clashing with friars (they had absolutely nothing to do with it) but because she was accused of poisoning her sister-in-law. I would have loved telling her that Rizal was shot to death not to be set as an example to future revolutionaries but simply because he was found guilty of conspiring against the government, and that his accusers were, ironically, the sworn enemies of the Catholic Church: the Freemasons (technically, the enemies of the Church did him in), and that it was the government that decided to have him executed. I would have loved telling her that Rizal was not forced to retract, that he even rejected a first draft of it, and that he accepted a modified version later on. I would have loved telling her that she should first read the documentary evidence presented by Fr. Jesús Mª Cavanna, C.M. regarding the retraction controversy before she could even start arguing for or against it. I would have loved telling her that the real villain in Noli Me Tangere was not Padre Dámaso but Padre Salvi, and that it is wrong to invoke satirically fictional characters vis-à-vis history. But I didn’t bother anymore. Anyway, to say that the GomBurZa priests were friars (when in fact they were secular priests) in that same column is more than enough not to trust Carmen Pedrosa in the telling of our country’s history. In that regard, the historical introduction to this fantastical column of hers has become null and void. So may her pen just stick to political analysis, i.e., intelligently written political speculation. The best spot to take a photo of Paeté, La Laguna’s breathtaking Iglesia de Santiago Matamoros is several feet away from its façade so that the church would appear superimposed with picturesque Mount Ping-ás (photo taken on 2 November 2014). But no, I will not stop her from defending President Duterte. After all, she’s been given the free will to defend blasphemers. What worries me is that, in spite of her numerous columns attacking the Catholic Church, we see a couple of instances wherein she extols the legacy, artwork, and importance of the beautiful church of Paeté which is her hometown in La Laguna Province. That church, its artwork, and even the culture and tradition of her hometown were all the handiwork of the friars she loathes so much. As a matter of fact, the whole town of Paeté was founded by friars. She might as well write articles exhorting the destruction of that church and her hometown as well, for critics will easily see the hypocrisy of her Holy Week pilgrimages and whatever concern she has for the church of Paeté. And judging from her less than admirable knowledge of Filipino History, one can surely tell that she can easily fall prey to gullibility. After all, isn’t she the same columnist who fell victim to a satirical blogpost years ago? Today, the feast day of Our Lady of Mount Carmel, has just been declared as the Day of Prayer and Penance in reparation for blasphemies, slander, and murder. 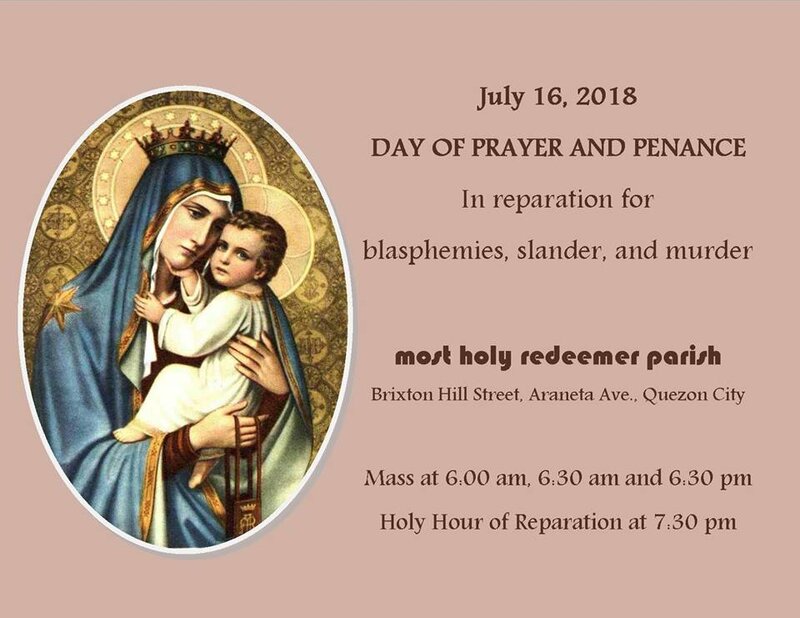 There will be Masses at the Holy Redeemer Parish Church (1 Brixton Hill Street corner Landargun Street, Gregorio Araneta Avenue, Quezon City) at 6:00 AM, 6:30 AM, and 6:30 PM. The Holy Hour of Reparation begins at 7:30 PM. Carmen Pedrosa and President Rodrigo Duterte are very welcome to attend. This entry was posted in Anuncio, Catolicismo, Filipino History, José Rizal, Paeté, Provincia de La Laguna and tagged blasphemy, Carmen Pedrosa, Day of Prayer and Penance, Rodrigo Duterte, The Philippine Star. Bookmark the permalink.